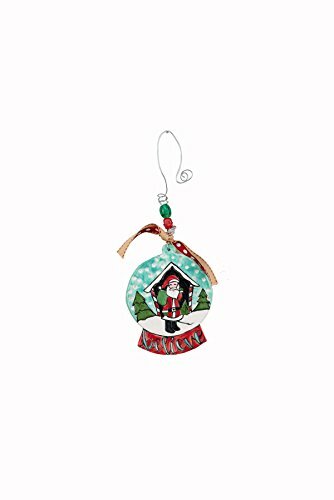 Glory Haus believe Santa flat ornament, measures 4 x 4.5 x 0.25 – Glory Haus was founded in 2008 by friends with creative hearts and a common passion. As a designer and manufacturer of inspirational gifts and home decor, our hope is to bring encouragement and joy into your home. The mission of Glory Haus is “community transformation that glorifies the Lord and changes lives through our work, art and relationships.” our collection of 2, 000+ products includes ceramic ornaments, wall art, picture frames, canvases, jewelry, mugs, pillows, collegiate products, and more. We are proud that all of our linen products are handmade at our fair-trade factory in India. This factory provides employment, training, and hope to impoverished women, which reduces poverty & injustice and gives dignity, freedom, and hope to those who have been caught up in the cycle of economic and Social oppression. Glory Haus is also proud of our leather products, which are handmade with love and provide hope & employment to women who are transitioning out of homelessness.